Smoothwall have announced that the IN06 update will be released soon to all SWG, UTM and WAM customers with current software maintenance. This update brings brand new Application Bandwidth Reporting, an overhaul of Portal-Based Reporting, Secure Global Proxy, and a new version of Smoothwall Connect, the remote filtering client for Windows devices. 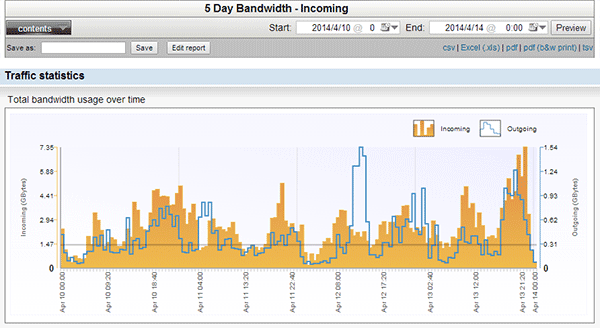 IN06 sees the release of a new, application-aware bandwidth reporting feature. This measures incoming and outgoing bandwidth usage across external connections, and bridges. Bandwidth reporting is a completely automatic process within the Smoothwall SWG & UTM and requires no configuration. Reporting on standard web protocols (HTTP, SMTP, FTP, etc) is provided as a standard function of the software. Reporting on applications (YouTube, P2P, Skype, etc.) is subject to you having a Layer 7 Application Control (deep packet inspection) license. Bandwidth is measured and reported on by application and is stored in the standard data store enabling reports to be provided over any time period. In addition, Application Bandwidth Reporting can send alerts when applications (or groups of applications) exceed certain bandwidth limits. Application Bandwidth Reporting is usually a licensable feature, but Smoothwall are providing its entire suite of functions free-of-charge from October 2014 until February 2015. Please note: while Bandwidth Reporting includes layer 7 DPI functionality, this will not extend to the layer 7 firewall blocking features unless you already have that license enabled. Smoothwall have completed a significant overhaul to the web portal system for creating and viewing reports. The web portal is designed to be used by less technical individuals without Smoothwall training, and enables them to run any report you choose — even custom reports. In order to simplify reporting, Smoothwall have also reduced and redesigned the number of standard report templates to those most frequently used by customers. This has resulted in just over 60 templates, representing those offering the most value in everyday usage. The Smoothwall operator has the ability to enable access to as many (or as few) of these report templates as necessary on the user portal. This newly designed system will make report generation more accessible to both trained and non-trained Smoothwall operators. 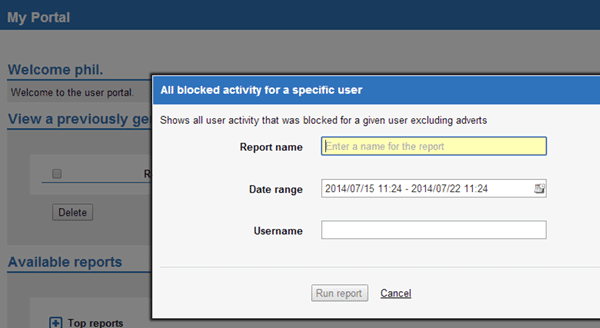 All reports are available through the User Portal - even the new Application Bandwidth report. Smoothwall's new Secure Global Proxy allows all of the smarpthones, laptops and tablets outside of your network to connect directly to the web filter. There's no blind spot — any device, any place, any time. This is a new web filter feature for the UTM products. It allows direct connection to the web filtering engine through external interfaces. Prior to this feature it was not possible for a single Smoothwall to provide web filtering for clients outside the local network. It was only possible by forwarding connections to the web filter's internal interface, and required one Smoothwall and an additional device performing the traffic forwarding (a second Smoothwall or any routing/firewall device). With the Secure Global Proxy we no longer require a second device to provide the same service to external clients. Since this new function allows the web filter to be exposed as a public-facing service, we have added an additional layer of certificate security to negate any potential risk from malicious abuse. The Secure Global Proxy uses NTLM authentication, and is a perfect complement to iOS Global HTTP Proxy, Android tablets, Chromebook, Windows and OSX laptops. It should be noted that unless the Android device in question can be restricted to prevent alteration of proxy settings, this does not represent a complete remote filtering solution for Android. The new remote filtering client, Smoothwall Connect for Windows, makes filtering on the road faster than ever. Real-time policy updates, a reduced footprint, and captive portal support make filtering remote users a breeze. Although not strictly a part of this software update Smoothwall have also released a significant update to the Smoothwall Connect Filter client for Windows. This new update supports Windows 7 & 8 (including Metro) and automatically determines whether the computer is local to the web proxy for filtering, at a remote connection (for example, at home), or behind a captive portal (coffee shop or hotel). If local it simply connects to the web proxy filter. If it detects it is remote it makes a secure connection to the remote web proxy for filtering. If it determines it is behind a captive portal it enables the user to log in to the portal prior to establishing a secure connection to the remote web proxy. Smoothwall Connect Filter 2.2 redirects all HTTP and HTTPS traffic from the computer and doesn’t need any proxy settings. This is a significant update and we recommend you install during off-peak periods. Please note that due to the impact of this update the system will require a reboot after installation. Mobile Guardian v1 has, until recently, been the only supported client software for Windows that allows remote filtering of content. Smoothwall Connect Filter 2.2 for Windows supercedes Mobile Guardian and as of 1 January 2015 Smoothwall will no longer provide software updates for Mobile Guardian or the MobileGuardian module within a Smoothwall solution. Smoothwall will continue to allow use of the MobileGuardian module in the medium term to allow our customers to plan a migration path, either to Smoothwall Connect Filter 2.2 for Windows or a solution based on the new Secure Global Proxy feature. For customers that deploy Smoothwall solutions as part of a managed service, you will soon be able to create a Smoothwall Multi-Tenant Managed Service (MTMS) configuration. This provides a means to logically partition a Smoothwall cluster to support multiple discrete tenants (clients). A core set of policies applies to all tenants with the option to create unique tenant-administered policies tailored for individual clients. 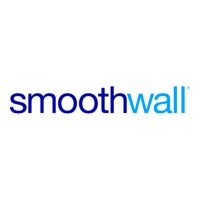 Find out more about Smoothwall for Managed Services in our next Product Update, or speak to your Account Manager.